Andrew is a great swimmer! He always has enjoyed being in the water and loves diving down for things like dive sticks and rings. People are always amazed at how comfortable he is in the water and I was encouraged to sign him up for swimming lessons so that he could learn the strokes and be on the swim team. I was a little reluctant to do this but thought I’d give it a try. Well, it didn’t necessarily go the way I had hoped (not the first time and I’m positive it won’t be the last!). The whole experience was overwhelming due to the fact that swim team practice was held during his lesson time. He thought that the swim team swimmers were hysterical to watch, all of those arms and legs flapping wildly, the goggled faces bobbing up and down (I’m smirking just imagining what it must have looked like to him!) and he would swim over and get in front of them. This was not exactly the ideal situation and I decided not to waste any more money. We’ll try again of course, just in a more private setting next time. While lessons didn’t go well, I did notice that his left arm did not come out of the water in the same way that his right arm did. When he swims, he tends to use his arms together in a “breaststroke” technique to get to the bottom of the pool as well as anywhere else he wants to go. I wanted to be able to work on this with him and give his arms some practice with different swim strokes. 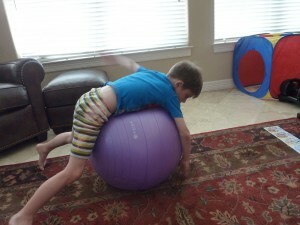 We are lucky to live somewhere warm and have access to pools, but it’s not always ideal and thought about using my exercise ball to work on this as part of My Obstacle Course. We did and it worked great!! 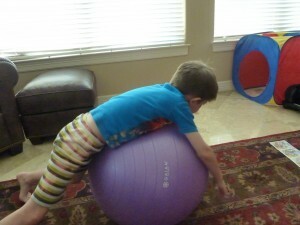 For this station activity, all you need is an exercise ball, squishy couch cushions or stacked pillows and you are set. Getting ready to work on some swim strokes. Notice how he’s even able to put his head up and down like he will need to do in the pool. Working to get that arm up and around his ear. 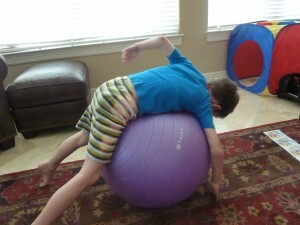 I also used the ball to help him get comfortable with floating on his back, something he was not crazy about. I held him (just like I would in the water) with one hand under his neck and another under his thighs. The ball wiggles a little bit which is good because it mimics floating in water. I encouraged him to pretend he was looking up at the bright blue, sunny sky and would even ask him how many birds he saw. I share this because I know many parents who want their children to swim and felt like this was a good, easy way to practice the “floaty” sensation feelings that go along with swimming as well as work on some strokes without getting wet!